A20-OLinuXino-Micro is fully OSHW A20 based development board from our friends at Olimex. This board was originally designed with the pin-compatible A10 in mind. While this design never shipped, Olimex can produce A10 versions of this board if you so desire. The board helpfully reads "A20-OLINUXINO-MICRO". There are also several fex files dealing with the different LCDs in the same directory. For building U-boot, use the A20-OLinuXino_MICRO_defconfig target. There is another U-boot target for the eMMC version, A20-OLinuXino_MICRO-eMMC_defconfig. Use the sun7i-a20-olinuxino-micro.dtb device-tree binary. See mainline kernel. The recovery button triggers FEL mode. 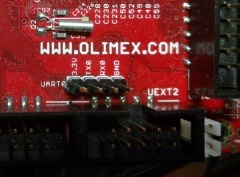 See the Olimex LCD Modules page for more information on how to attach and set up Olimex LCD panels on this hardware. GPIO-1 / LCD_CON - compatible with 4.3", 7.0", 10.1" LCD modules from Olimex, can also be used for general GPIO support. There is a clearly marked UART on the top of the device. All you have to do is connect some wires according to our UART howto. Warning: Do no connect the 3.3V pin. This could damage your board. There are of course no rebadgers for this device, but you might sometimes see it referred to as the A20-Olinuxino. Our local Olimex page showing all other Olimex products. Original announcement on Olimex's blog. This page was last modified on 11 April 2019, at 16:36. This page has been accessed 41,191 times.